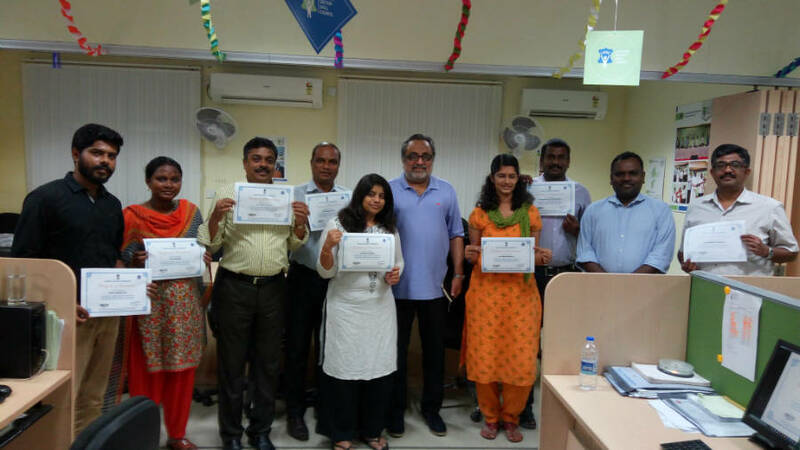 LSSC held the RPL Type 4 certification distribution ceremony on 27th January 2019 at Pioneer Inc, Chennai. The certificates were handed over by Mr. Rajesh Agrawal, IAS, Joint Secretary, Ministry of Skill Development and Entrepreneurship (MSDE) in the presence of Mr. Ramesh Kumar IAS, CEO, LSSC, Mr. Gopakumar Nair, Pioneer Inc, Mr. Rajesh Rathnam, COO, LSSC and other members from the industry. 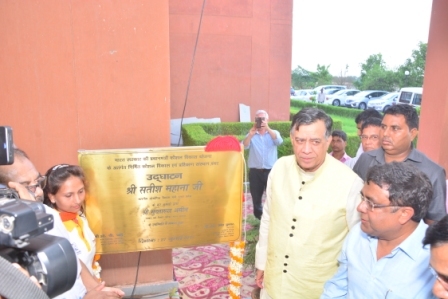 RPL Type 4 with Best-in-Class Employers (BICE) has been introduced to enhance the industry acceptability of RPL certification and extend the outreach of the scheme directly to reputed employers/ industries across sectors. This is a new type of RPL category envisaged under PMKVY 2016 – 2020 to ensure certification of skills available in the organized sector with best in class employers. This will help achieve certification at scale while ensuring its economy and quality of certification since it is conducted at the employers’ premises. In his welcome address, Mr. Gopakumar Nair, Pioneer Inc expressed his gratitude for the RPL Type 4 initiative from the government and said that Pioneer Inc was privileged to get their employees certified under this scheme. He also complimented Mr. Ramesh Kumar CEO, LSSC for his continued efforts to build capacity in the leather industry through skill development, apprenticeships and training of trainers. Speaking on the occasion. Mr. Ramesh Kumar, CEO, LSSC appreciated the dedication of Mr. Rajesh Agrawal, the guest of honour, towards skill development and described how he was committed to making Skill India mission a success through various programs. He also thanked him for attending the event on a Sunday, despite his extremely busy schedule. To set the context, Mr. Ramesh Kumar shared a brief overview of the leather industry and its significance to Indian economy. Being a tradition sector, he said, leather sector forms the backbone of the export market and it has a huge potential for employment generation. The prime focus accorded the leather sector through Make in India program by the Hon’ble Prime Minister and subsequent sanction of Rs. 2600 crores by the Government of India through DIPP for capacity building are landmark decisions in shaping the future of this industry. He also mentioned that LSSC had conducted a SWOT analysis to devise a strategy for capacity building to tap the export market of 6 billion USD, and domestic market of 9 billion USD. Delving deeper into the market potential, he said, the current import worth Rs. 500 million worth of footwear shows how the demand is growing on the domestic front with changing consumer behaviours. Hence, the need of the hour is to build capacity by investing in technology upgradation since people who work on the machines have a key role to play. Underlining the importance of skills upgradation programs, he said that the industry has improved the productivity to a great extent, by touching every cluster. He also mentioned that India is the second largest footwear producer in the world and the 5th largest producer in the leather garments in the world and second largest manufacturer of saddlery in the world. He was hopeful that with the policies of the government and with cooperation from industry members, the opportunity to conquer the market will soon become a reality through a skilled workforce. Certified 600 Trainers & 300 Assessors since inception under ToT Program. Major Brands are Coach, Country Road, Mossimo Dutti, Tommy Hilfiger, Marks & Spencer, Nike, Bata, Red Tape, Barrats, Deichmann, Echo. Mr. Rajesh Agrawal IAS, Joint Secretary, MSDE, guest of honour, began his address by thanking the participants for sparing their personal time on a Sunday and candidly shared his excitement about his first visit to the leather industry at Pioneer Inc. While drawing parallels with the textile and garments industry, he said that leather industry can produce a huge number of jobs. This is one way to address the job creation challenge wherein every one crore of rupees produces 80 to 100 jobs. He also spoke about how leather industry is critical in balancing the industrial ecosystem in India by complementing animal husbandry. He emphasized that this industry will remain in focus for job creation and it has a huge potential to expand and grow, particularly in the accessories market by doubling the exports in the coming years. This not only boosts job creation but also adds to foreign exchange, thereby directly contributing to national building. Mr. Rajesh Agrawal also shared a brief background to the creation of the Ministry of Skill Development and Entrepreneurship and said that it has multifold objectives. First, the ministry’s mission is to address the skill requirements of the industry and second, their commitment to meet the youth aspirations by ensuring every individual gets an opportunity to improve his or her skill sets and become market relevant and enhance their productivity. He said the Recognition of Prior Learning (RPL) tries to bridge both these objectives by formally recognizing and certifying the skills acquired through informal means such as self-learning on-the-job. The assessment of such skills and certification brings prestige and confidence by adding to the mobility of the workforce and reducing employer dependence for recognition. At the same time, from industry perspective, formalising the skills of employees will give a clear picture about the available skill sets, skill gaps and the need for upgradation to achieve desirable quality and productivity benchmarks. Making a case for apprenticeships, Mr. Rajesh Agrawal cited an interesting example of how one can learn to play football by watching the game or by learning under a professional coach and how the latter approach would improve our understanding and sharpen the skills. He described how the need to formalise on-the-job learning has a direct impact on productivity and highlighted the fact that India is the only country that has transferred the sovereign function of training of workforce to the industry body led by the Sector Skill Councils (SSCs). This is a crucial move to mitigate the ills of a public regulatory system and promote apprenticeships in a big way. He looked forward to the leather clusters in Tamil Nadu for active participation in the National Apprenticeship Promotion Scheme (NAPS) since practical training is indispensable for skill development and it has to happen in the workplace since it can’t be recreated in a laboratory set-up. In the long run, apprenticeships would make a huge positive difference to the industry. With regard to female workforce in the leather sector, he said that he was glad to see the presence of many women in the RPL event and said that our endeavour should be to grow women workforce from 24% to 50% since women constitute 50% of the Indian economy. This will also provide a 200% growth to India’s GDP and leather industry will have a major role to play since it employs many women in various job roles. As an aside to his talk, Mr. Rajesh Agrawal brought to the fore the impact of latest technologies and automation in the leather sector. He said that the Internet Age has seen a gradual stagnation of return on labour while the return on capital has grown exponentially. Expressing a deep concern about the growing impact on technology that could affect the labour force, he pointed out the need for promoting inclusive growth that invests in labour through skilling and adopting labour-friendly technology that will assist but not replace labour. On this reassuring note, Mr. Agrawal closed his address and congratulated the candidates who were receiving their certificates. After distributing the certificates, the event was concluded with a vote of thanks from Mr. Sundara Rajan, Pioneer Inc shared the industry perspective on the need for skilling the workforce for improving productivity and including suitable measures to cater to 70% to 80% of women workforce.